Asus on Sunday started shipping its Transformer Pad 300 tablet in the U.S., with the company pitching the tablet as a gaming device and laptop replacement. The tablet has a 10.1-inch screen, Google's Android 4.0 operating system and a quad-core Tegra 3 processor from Nvidia running at a clock speed of 1.2GHz. The tablet is priced started at US$379.99 for 32GB of storage and 1GB of RAM. Though most features are similar to those available in its predecessor, the Eee Pad Transformer Prime, the starting price is lower. Among the new features are GPS capabilities and the new OS is pre-installed. The company did not immediately comment on worldwide availability. 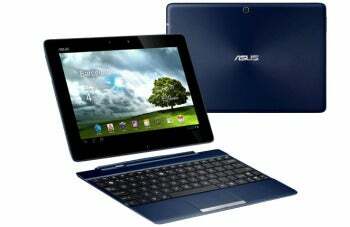 The tablet is the first that does not have Asus' famous "Eee" moniker, which debuted in 2007 with the pioneering Eee PC 700 netbook. Asus is upgrading its tablets at a furious pace, and the new tablet comes just six months after it shipped the Transformer Prime, which was the industry's first quad-core tablet. Asus also joins a bevy of companies pricing Android 4.0 tablets under US$400. Samsung's Galaxy Tab 2 10.1-inch tablet will ship on May 13 and starts at $399.99. The aggressive pricing strategy of Android tablets may be an attempt to take market share from Apple, which is expected to dominate the tablet market this year, according to Gartner. Apple's iPad is priced starting at $499. The Transformer Pad 300's 10-hour battery life can be extended to 15 hours with an additional battery in the optional $149 keyboard dock. The dock has a full keyboard and a touch pad to make the tablet a functional laptop. The dock has Android-specific buttons for quick access to tablet functions, and also USB 2.0 and SD card slots. The tablet weighs 635 grams (1.4 pounds), according to Asus. The display shows images at a resolution of 1280 by 800 pixels, and the Tegra 3 chip enables a strong gaming experience with 12 integrated graphics cores. The 8-megapixel rear camera on the tablet can shoot video at 30 frames per second. There is also a 1.2-megapixel camera on the front of the tablet. A micro-HDMI port allows the tablet to be connected to TVs. For expandable storage, the tablet has a microSD card slot. The Transformer Pad 300 has been advertised with 4G LTE, but this tablet does include mobile broadband connectivity features. Asus is also bulking up its cloud offering with the tablet, offering 8GB of free storage on it Asus WebStorage service. The WebStorage service allows users to share files and backup data to PCs. Software on the tablet includes Polaris Office, which makes it easier for users to see Word, Excel, and PowerPoint files. An application called App Backup can save data to local or removable microSD storage.